Suitable for men as well as women, this Sally Hansen kit consists of 6oz of microwaveable wax product, spatulas, strips and finishing oil, together with a comprehensive instruction leaflet. Retailing at around $11 it is an inexpensive and effective at-home hair removal product. Manufactured in the USA, Sally Hansen Lavender Spa wax kit retails at around $11 to provide an an inexpensive at-home hair removal solution. It is microwaveable, for ease of heating and is suitable for sensitive skin, on all areas of the body. There are​ plenty of the cloth strips and spatulas provided in the kit, and there is a small bottle of finishing oil, to help remove any excess wax and leave the skin smooth. The wax is a synthetic-looking, mid-violet colour and has a mildly lavender-scented​ odour which, as you would expect, becomes slightly stronger with heating. The first thing I noticed when I opened the pot was the violet colour - as I mentioned, it is synthetic looking and although this is not to my taste, it is pleasantly and not over strongly scented. At this point the wax becomes soft, pliable and easy to use with the wooden spatulas provided. Once it starts to cool and thicken again, you will need to re-heat to keep the correct consistency, or the product becomes ineffective. This is a pale bluish coloured, unscented oil used to remove excess wax from the skin after treatment, whilst moisturizing, softening and calming it. It is a small bottle, but a little goes a long way. It can also be used to help clean off any small spillages. Alternatively any other oil that you have may serve this purpose just as well if you would rather conserve the Azulene Oil for your skin. The Sally Hansen Lavender Spa wax kit is designed to be used all over the body; arms, legs, underarms, bikini line and can even be used by men for back and chest hair. Hair should be at least 1/4" long, but not longer than 1/2"
Wash skin with soap and water to ensure it is free of all creams, lotions etc. and then make sure it is thoroughly dry. Wait for at least an hour after showering or bathing before using wax. Always read all the instructions carefully and fully before using the product, and do not use on irritated or broken skin. Certain medical conditions affecting the skin may preclude use of waxing for hair removal - if in doubt seek medical advice. There are pros and cons of all types of hair removal, but here we are only concerned with the pros of home waxing. The most obvious advantage is the cost, with home waxing kits available from around $12 upwards, against a salon fee of at least $30+ for two half legs. Most kits will give you sufficient for at least a couple of half leg treatments. There is also the convenience of being able to carry out the procedure in your own home and at your own convenience. No need to wait for an appointment - and then perhaps not being "in the mood" or being tight for time. Other at home options are shaving, depilatory creams and epilating. The results of waxing last longer than shaving or depilatory creams, both of which remove hair at the skin's surface. Shaving is generally a daily task and depilatory creams last a little longer, whereas the results of waxing can last anything from 1 - 6 weeks depending on the area and individual regrowth rates. ​Waxing is quicker than using an epilator - removing hair from fairly large areas in one tug! Regrowth after waxing tends to gradually become lighter and finer over time, with regular use, unlike shaving and creams which have no effect on regrowth. Shaving can also often lead to a stubbly effect. Waxing is a painful process as it pulls hair out by the root. There are ways to minimise the pain using medication, such as oral painkillers taken 30 minutes prior, or skin-numbing creams and sprays and there are also other, more natural precautions you may take. These are outlined in our articles 8 ﻿top tips to﻿ minimise pain while waxing and best products to relieve pain while waxing. In general, the pain is worst the first few times you wax as the skin becomes more tolerant to the process over time, with regular use. How many strips are provided? Can this product be placed on a candle warmer? ​Yes it is, but if you are worried, we advise that you do a patch test by trying a small area first and wait for 24 hours to see how your skin reacts. Use a baby powder or similar on your skin prior to use. How long does hair need to be? 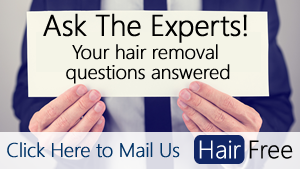 To effectively remove hair with wax, it needs to be at least 1/4" long so that it adheres well. It should not be longer than 1/2". Is there a danger of burning the skin? Yes, overheating the wax can cause burns. Never microwave for longer than one minute, but start with 30 seconds, and then increase in increments of 15 seconds until the correct consistency is achieved. Leave in the microwave for one minute after heating before removing the pot and carefully test a small amount on the back of your hand to ensure that the temperature is comfortable, before use. This product is effective, but it can be messy so you do need to take care when using to avoid getting wax on clothing, carpeting etc. It is pleasantly scented, inexpensive and with a little practice works well. Messy - can be messy and oil required to "clear up"